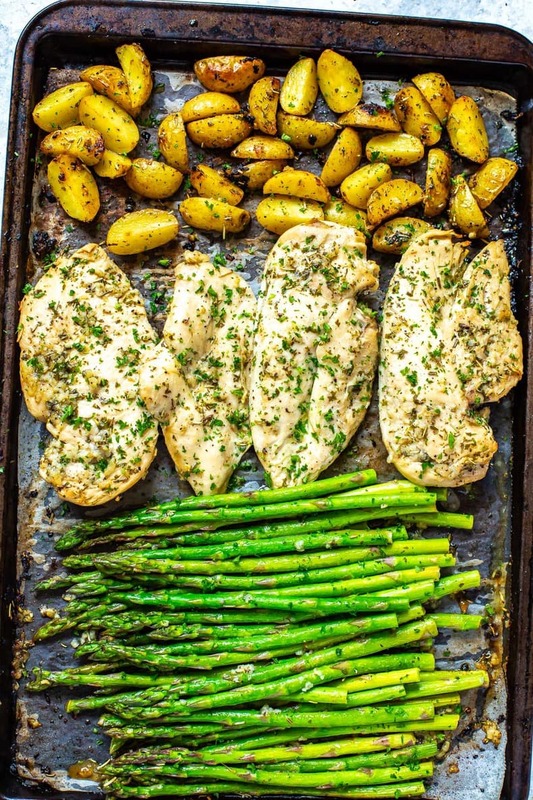 This Sheet Pan Chicken and Asparagus with lemony potatoes is one of our favourite simple chicken recipes. 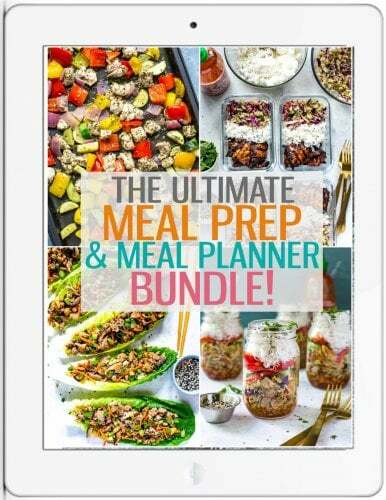 This healthy, Whole30 approved meal prep recipe comes together in less than 30 minutes! 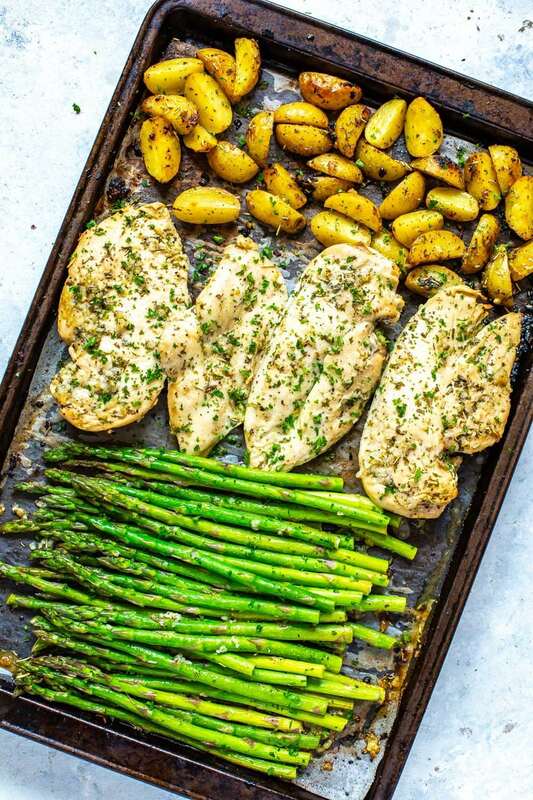 If you love asparagus and lemon chicken separately, wait until you taste them together in this sheet pan dinner. It is so delicious! The bright, citrus flavor of lemon pairs perfectly with baby potatoes and fresh asparagus. What type of chicken and asparagus should I use? If you want this meal to be as healthy as possible, using chicken breasts is recommended. That being said, any type of boneless, skinless chicken can be used to make this recipe. When choosing what type of asparagus to use, green and white asparagus are both great choices. If you're on a Whole30 diet, you may want to stay clear of purple asparagus. Although it has a deliciously sweet, fruity flavor, purple asparagus has a higher sugar content than white and green asparagus. Regardless of the color, for this chicken and asparagus recipe, choose asparagus stalks that are medium in width. If the stalks are too thick, the asparagus may not completely cook through. If they’re too thin, they may overcook, becoming mushy and stringy. If you love those thin, crisp stalks of asparagus, use them to make things that require less cooking time. I use them when I make grilled asparagus flatbread or creamy asparagus, leek and potato soup. 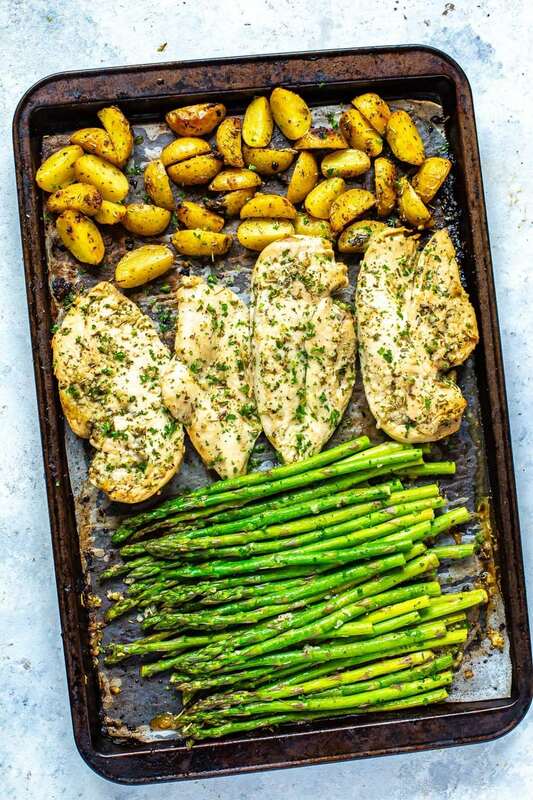 This simple sheet pan recipe uses a lemony-garlic marinade made using ingredients from your pantry so you don't have to run out and buy a whole bunch of different ingredients. With the help of a little olive oil, lemon juice, garlic, dried rosemary and parsley you've got a delicious, healthy lunch prep idea. You can also add others herbs and spices if you'd like, but rosemary and parsley are my go-tos when it comes to seasonings. Do you have to peel asparagus before cooking? Whether or not you peel asparagus stalks depends upon their thickness. Generally, the larger the stalks of asparagus are, the thicker the peel will be. For the most part, asparagus that is less than ½ inch (1.3 cm) thick won’t need to be peeled. If the asparagus does need to be peeled, a vegetable peeler will do the trick, or just use a paring knife. Some people like to cut their asparagus into bite-sized pieces but to save time on prep and cook time, I'll just trim the ends. The thick woody ends of asparagus stalks should be removed. This is done in one of two simple ways: snapping or cutting. Snapping the ends off is easy enough, but more than likely, you’ll lose some of the useable parts. I like to use a knife for the job. Just trim about 1-inch off of the bottom of each of the asparagus spears. The main thing with this chicken and asparagus recipe is to make sure you don't overcook the asparagus. 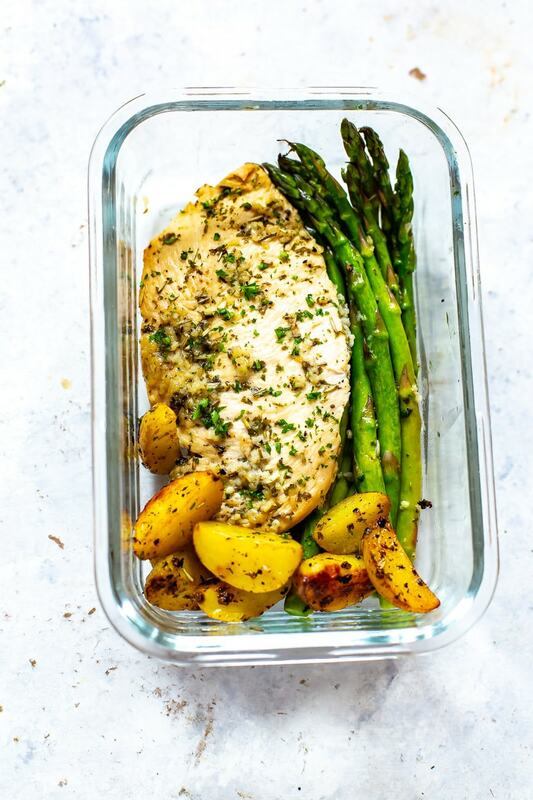 The chicken and potatoes take a little bit more time in the oven so while they're cooking first, you can wash and trim the asparagus to get it ready to throw on your sheet pan afterward. Asparagus only takes 10 minutes in the oven so make sure you don't overcook it! 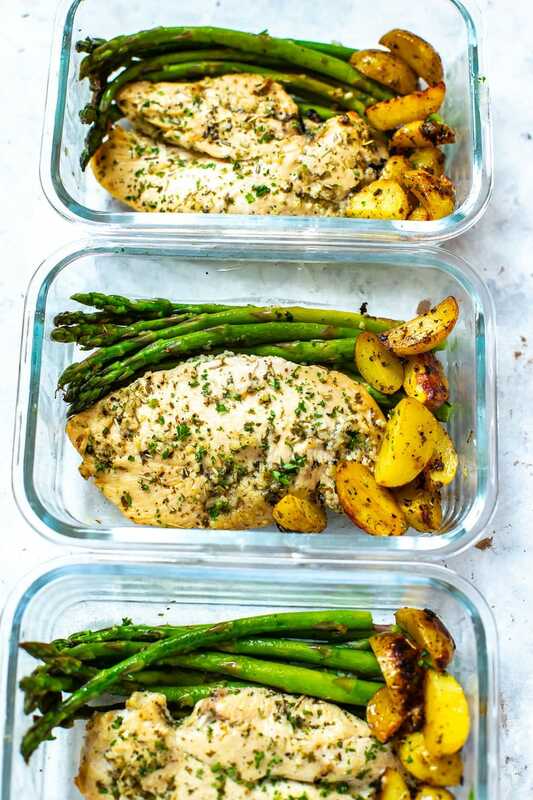 This simple chicken recipe works beautifully as leftovers, making it perfect for meal prep dinners and easy lunches during the week. 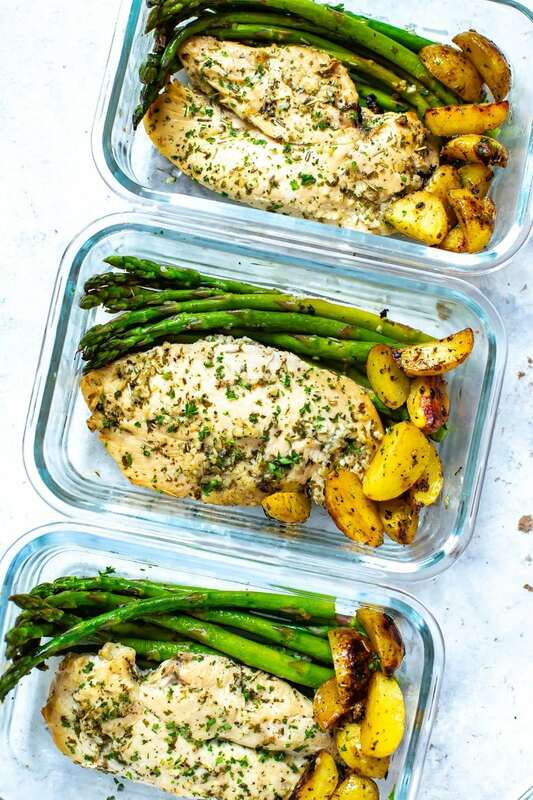 Before refrigerating the dish, be sure that it has cooled for at least half an hour and then place in glass meal prep containers. I prefer glass meal prep bowls because they are already microwave-safe so it's just a matter of removing from the fridge, taking off the lid and popping into the microwave for 2 minutes or so. You can also eat this recipe cold if you're in a pinch, it will still taste good! 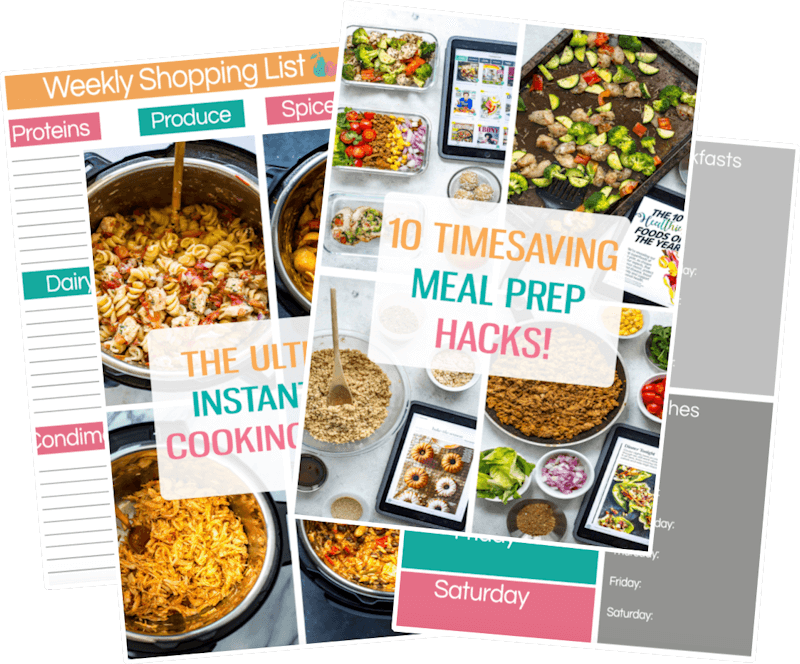 They will keep in the fridge up to 5 days so they are perfect for your weekly meal prep! 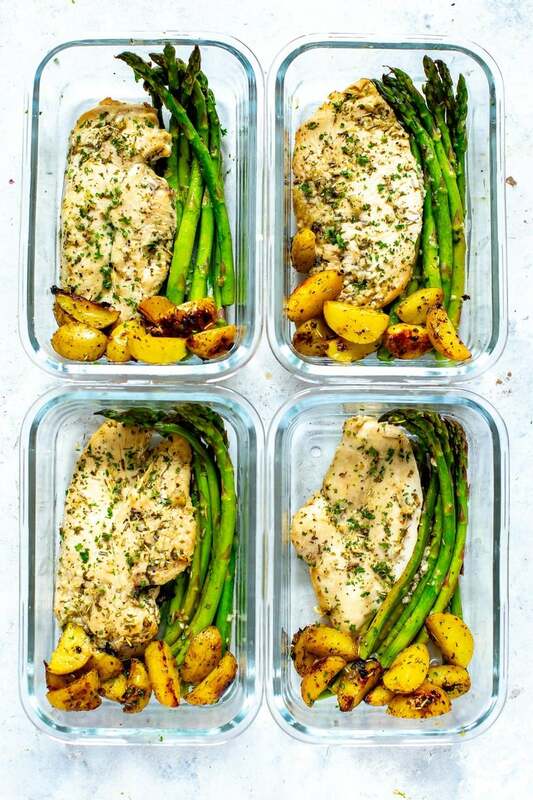 Grab some glass meal prep bowls if you plan on turning the chicken and asparagus recipe into your weekly lunches. 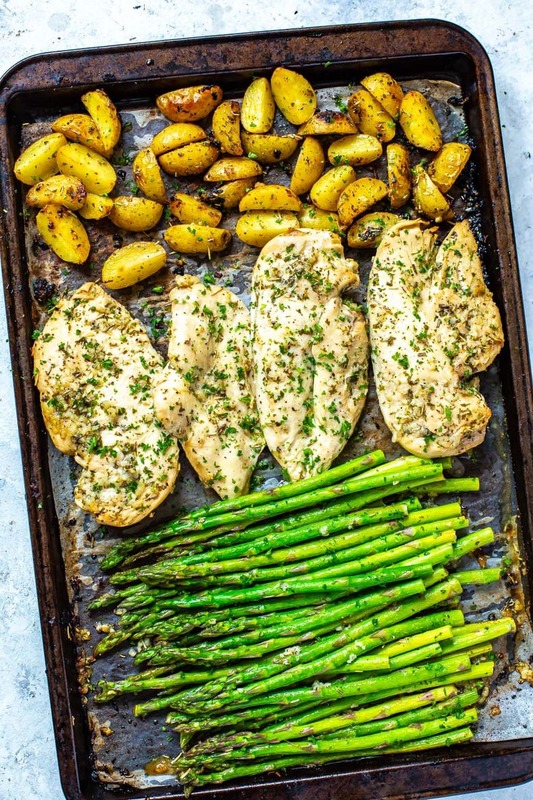 This Sheet Pan Chicken and Asparagus with lemony potatoes is an easy, delicious Whole 30 approved meal prep recipe that comes together on one pan. Preheat oven to 425 F. In a small bowl, mix olive oil, lemon juice, garlic, parsley and rosemary together. Add baby potatoes and chicken to a parchment-lined baking sheet and toss with lemon mixture. Bake for 15 minutes. Meanwhile, trim ends of asparagus. 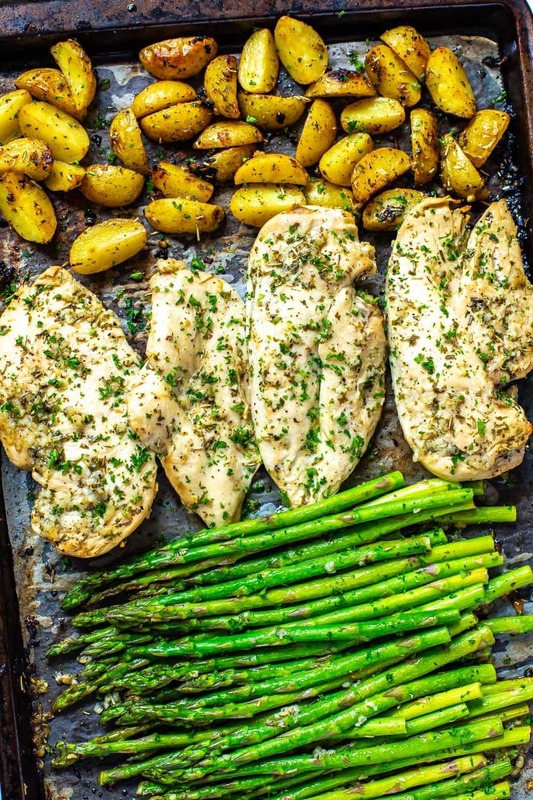 When chicken and potatoes come out at the 15 minute mark, add asparagus to the pan and bake for 8-10 minutes until tender. Serve and enjoy! Chicken can be sliced and everything can be divided among meal prep bowls. « 15 Breakfast Meal Prep Ideas for Busy Mornings! Can you freeze this? I am making these for my husband for work and he likes some variety not the same every day.